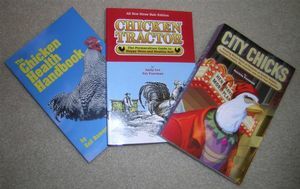 CITY CHICKS: Keeping Micro-flocks of Chickens as Garden Helpers, Compost Creators, Bio-recyclers and Local Food Suppliers by Patricia Foreman: My favorite general purpose backyard poultry book. CHICKEN TRACTOR: The Permaculture Guide to Happy Hens and Healthy Soil by Andy Lee and Patricia Foreman: This book provides a "beyond eggs" perspective regarding the benefits of backyard poultry. THE CHICKEN HEALTH HANDBOOK by Gail Damerow: This is a must-have reference book when a member of your flock is experiencing health issues.